The image below, from an earlier post, shows that temperatures moved up and down by roughly 10°C (18°F) between glacial and inter-glacial phases of ice ages, in line with the Milankovitch cycles, which made temperatures go up and down between 16°C and 6°C over the past 400,000 years (image below). The image on the right, an early Paleomap by Chris Scotese, shows average temperatures during warm and cool periods over the past 2 billion years. The average temperature over the past 400,000 was about 11°C. The Paleomap shows that the typical temperature in a cool period is 12°C, while the typical temperature in a warm period is 22°C, i.e. a difference of 10°C. Some 7,000 years ago, the global average temperature reached the natural maximum of the most recent Milankovitch cycle, and temperatures were between 15°C and 16°C. Since that time, the global temperature has come down. 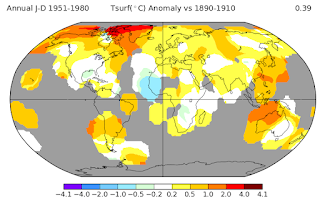 The average global temperature in 1966 was about 14°C. Without emissions by people, the temperature in 1966 would have been somewhat lower, and the temperature would have kept falling, had it not been for emissions by people which made the average global temperature instead go up to about 15°C in 2016. 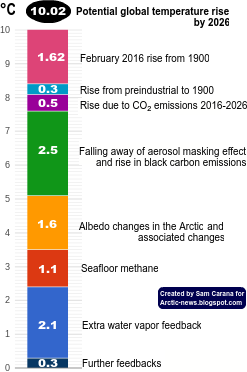 As the image below also shows, rises of some 100 ppm in the level of carbon dioxide in the atmosphere and of some 300 ppb in the level of methane in the atmosphere go hand in hand with a rise in temperature of some 10°C. 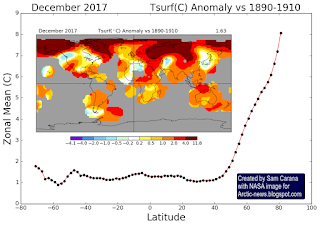 In other words, it looks like high levels of greenhouse gases in the atmosphere have already locked in an upcoming temperature rise of 10°C, i.e. a further rise of 10°C is already baked into the cake. 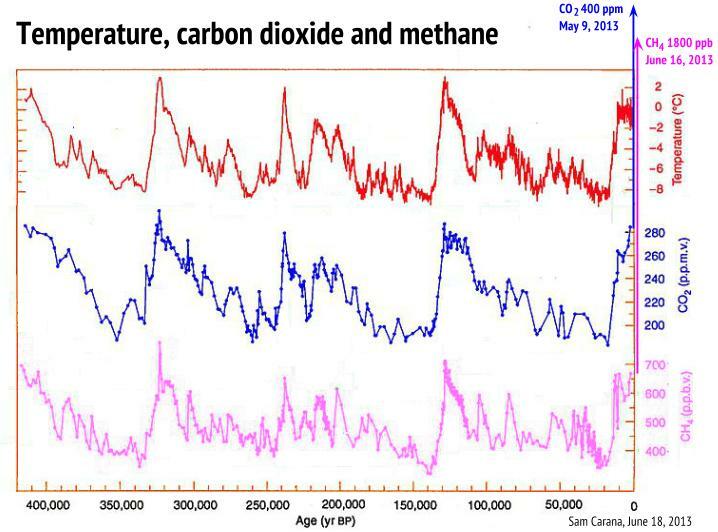 Indeed, temperatures look set to go well beyond any of the peaks in the Milankovitch cycles over the past 400,000 years. If average temperatures were to rise by some 8.1°C, they would reach a level virtually unprecedented in the entire history of Earth. The extinction page describes the elements of a potential temperature rise of 8.1°C. Note that this 8.1°C rise comes on top of the temperature rise that has already occurred from preindustrial to 2016. Below follows some links and calculations used to obtain the figures in above image. How much warming have emissions by people caused between pre-industrial and 2016? In 1951-1980 (i.e. 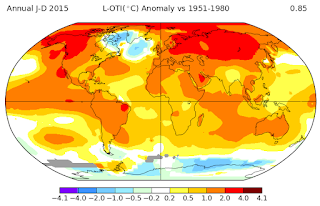 1966 ±15 years or NASA's default baseline), the temperature was 14°C (57.20°F). In 1900, it was 13.72°C (56.70°F), assuming that temperatures had risen by 0.28°C from 1900 to the baseline of 1951-1980, as the trend line below indicates (from an earlier post). In 1750, it was 13.42°C (56.16°F), as discussed in an earlier post, assuming that the rise from 1750 to the baseline of 1951-1980 was 0.58°C. - By using 0.3°C for the rise from 1750 to 1900, and adding 0.28°C for rise 1900 to 1951-1980. - Or, by using 0.29°C for the rise from 1750 to 1900, and adding 0.29°C for rise 1900 to 1951-1980. 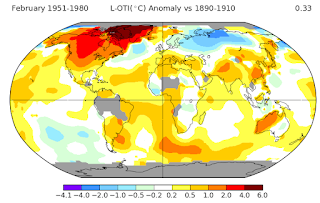 In 2015 (Jan-Dec), the temperature was 0.85°C above the 1951-1980 baseline (as the top image on the right shows). Using this figure, it was 14.85°C (58.73°F) in 2015. In 2016 (Jan-Dec), it was 1.00°C above baseline (as illustrated by image 2., captured in January 2017). 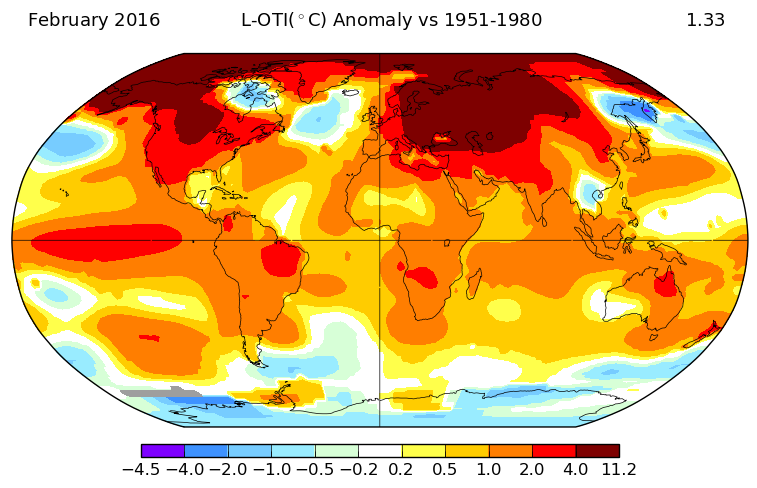 Using this figure, the temperature was 15.00°C (59.00°F) in 2016. In 2026, it could be 23.10°C (73.62°F) if temperatures were to rise by a further 8.10°C (i.e. from 2016). A monthly peak could take the temperature up even higher, to 23.44°C (or, more than 10°C above preindustrial or 1750). Such temperatures would be hotter than it has been for 500 million years. Note also that the high temperatures during mass extinctions were reached gradually over many years, whereas the current rise threatens to reach such a peak in just ten years time. Up to 96% of all marine species and 70% of terrestrial vertebrate species became extinct when temperatures rose by 8 °C (14 °F) during the Permian-Triassic extinction, or the Great Dying, 252 million years ago. During the Paleocene/Eocene Thermal Maximum (PETM), which occurred 55 million years ago, global temperatures rose by 5°C in ~13 years. In the video below, Guy McPherson discusses the situation. In 1966 (i.e. 1951-1980, NASA's default baseline), the temperature was 14°C (57.20°F) and in 2016, it was about 15°C. 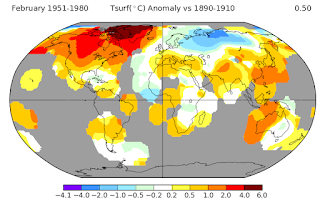 In 1900, the temperature was 0.29°C (0.522°F) below the temperature in 1966, or rather below the 1890-1910 temperature, as the top NASA image on the right shows. Using above figures would make the temperature in 1900 13.71°C (56.68°F) or about 1.28°C below the temperature in 2016. Next step. To get the full rise from 1750 to 2016, the rise from 1750 to 1900 must be added. How much was the rise from pre-industrial (1750) to 1900? Michael Mann once estimated this rise at some 0.3°C. In a later study, scientists including Michael Mann concluded that pre-industrial baseline was likely cooler than the 1850-1900 mean by potentially up to 0.2°C (0.36°F). According to this article, it's likely to be 0.2°C and as much as 0.21°C. Had people not raised greenhouse gas levels, temperatures would also have been a bit lower due to a natural fall in line with the Milankovitch cycles, which would have made temperatures a bit lower than what they were in 1900. Considering the above, a figure of 0.3°C of warming from 1750 to 1900 seems appropriate. Using these figures, emissions by people did raise temperatures by 0.3°C from 1750 to 1900, i.e. from 13.41°C to 13.71°C. 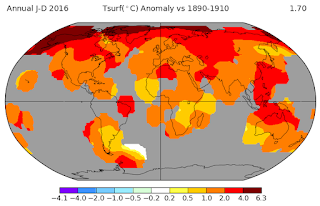 The temperature rise from 1900 to 2016 is about 1.28°C, so the full temperature rise 1750 to 2016 is 1.58°C, i.e. well above the aspirational guideline of the Paris Agreement. Further calculations follow below. The NASA image (image 4.) 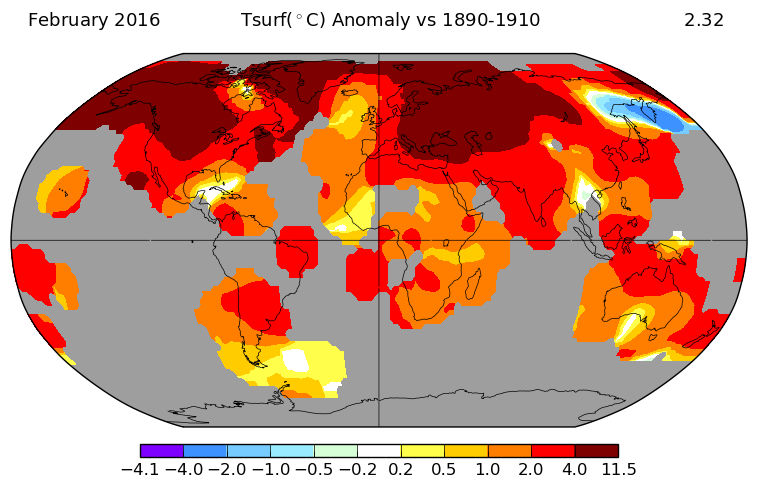 on the right shows that in 2016, it was 1.26°C warmer than in 1900 ±10 years (or 1890-1910). 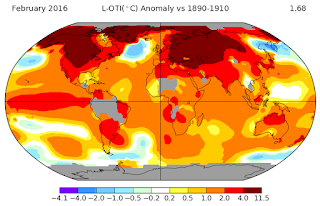 Adding 1.26°C to the above 13.71°C would make the temperature in 2016 14.97°C. 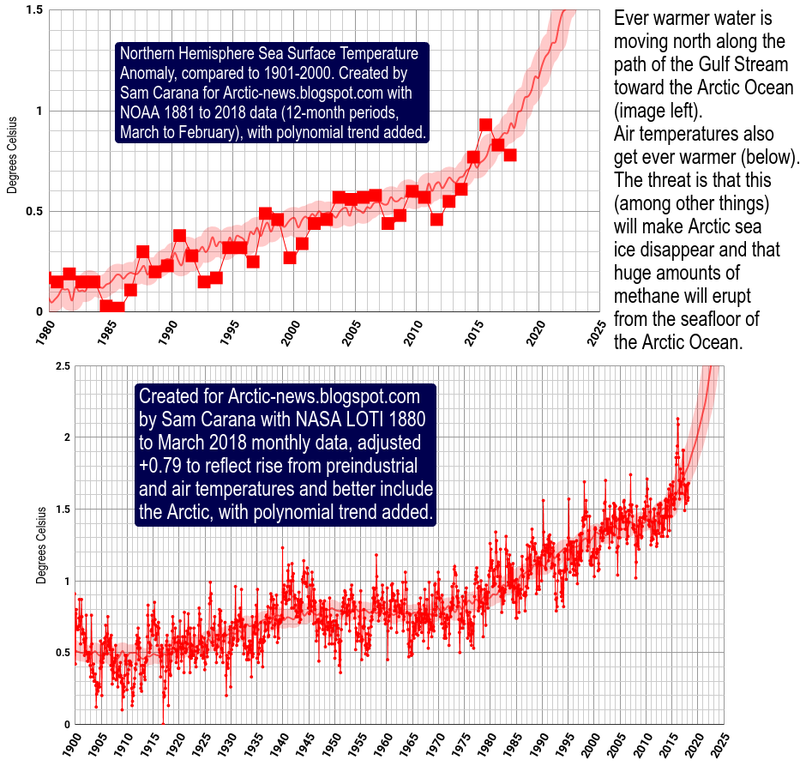 Another alternative way to calculate the 2016 temperature is to look at the NASA temperature rise from 1951-1980 to 2016, which is 0.99°C (as illustrated by image 5. on the right, which is a more recent version of image 1. further above). 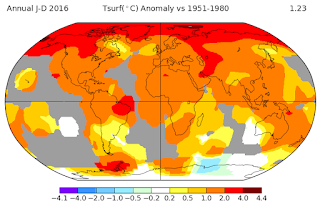 The 1951-1980 temperature (NASA's default baseline) was 14°C, so adding the above 0.99°C would make the temperature in 2016 14.99°C. Below are the same images, but instead of the global temperature rise, they show temperature for the land-only rise. The land-only temperature rise from 1890-1910 to 1951-1980 was 0.39°C, according to the NASA image on the right (image 6. on the right). 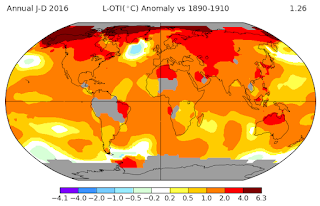 The land-only rise from 1890-1910 to 2016 was 1.7°C, according to the NASA image on the right (image 7. on the right). The land-only rise from 1951-1980 to 2016 was 1.23°C, according to the NASA image on the right (image 8. on the right). In conclusion, the global annual temperature rise from 1750 to 2016 is about 1.57°C (or 1.58°C, or 1.56°C depending on what calculations are used). This 1.57°C is well above the 1.5°C guardrail set by the Paris Agreement. The rise was even more for the monthly average for February 2016, as discussed below. 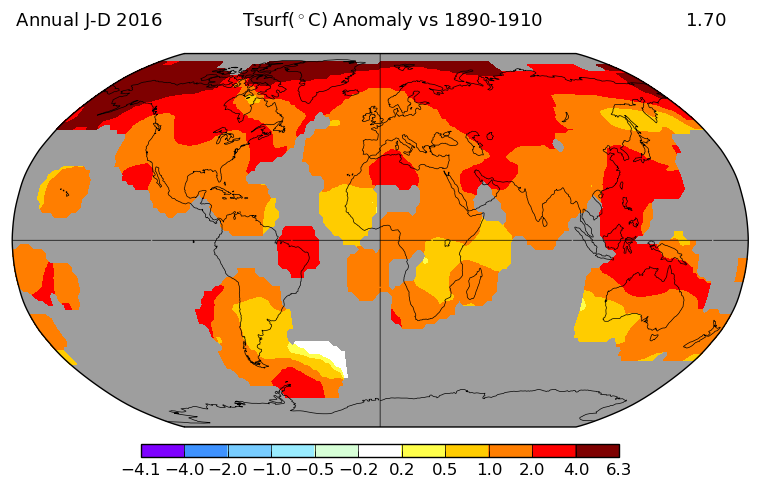 Furthermore, the temperature rise from 1750 to 2016 on land was 2°C or more, depending on what calculations are used. And of course, monthly peak rise on land was even more. 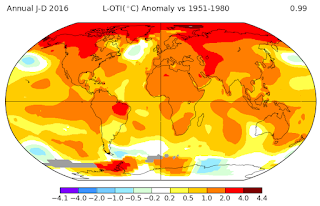 Global peak monthly temperature anomalies were very high in February 2016. 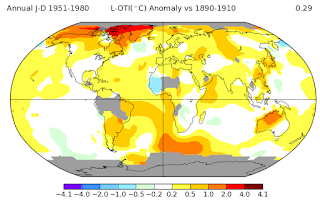 The global February temperature in 1951-1980 was 0.33°C higher compared to 1890-1910. 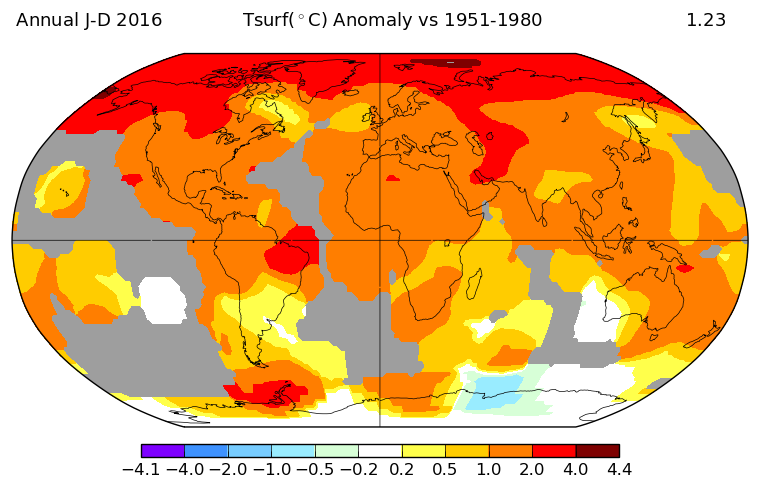 The monthly temperature anomaly in February 2016 was 1.33°C compared to 1951-1980. The monthly temperature anomaly in February 2016 was 1.68°C compared to 1890-1910. The land-only February temperature in 1951-1980 was 0.5°C higher compared to 1890-1910. 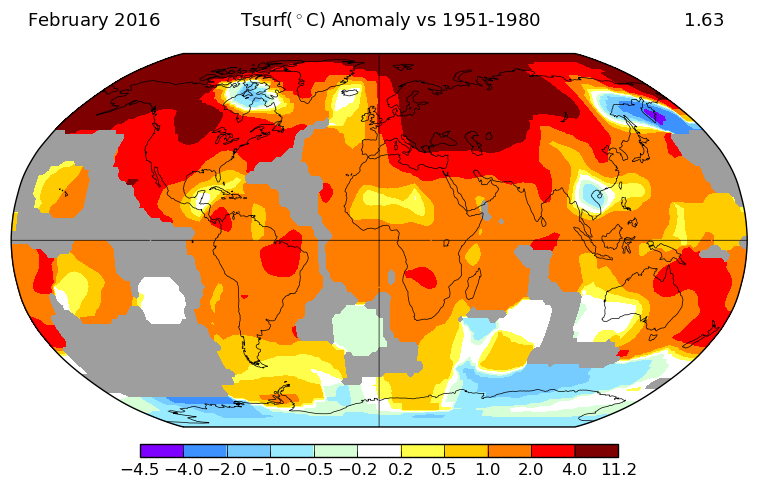 The land-only monthly temperature anomaly in February 2016 was 1.63°C compared to 1951-1980. The land-only monthly temperature anomaly in February 2016 was 2.32°C compared to 1890-1910. 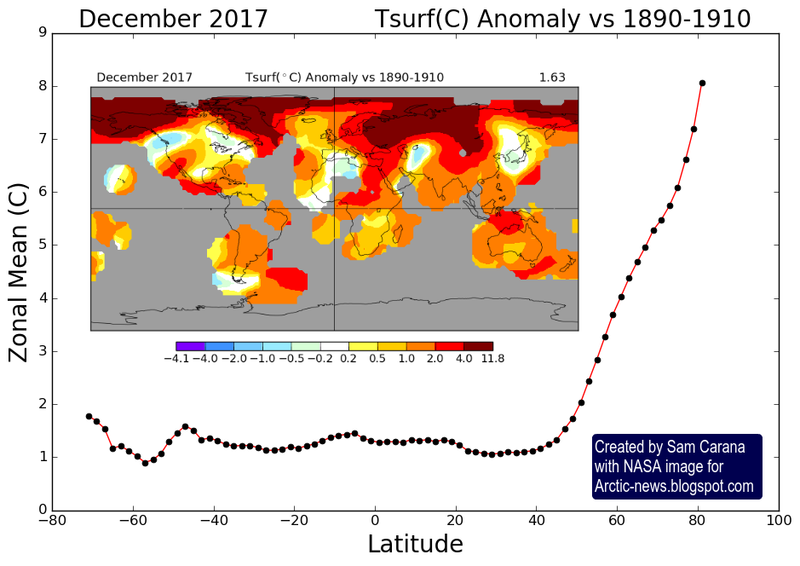 The land-only monthly temperature anomaly in December 2017 was 1.63°C compared to 1890-1910. The anomaly is even higher when looking at temperatures on land on the Northern Hemisphere only and when taking preindustrial as baseline.